This past weekend I did something that I had not done before. I ran a half marathon. One of my hobbies is running. I do it to stay fit and in an effort to keep the weight off. I am a bear, just not as big a bear as I could be because of running. One of my goals I mentioned in an earlier post was to run a half marathon. 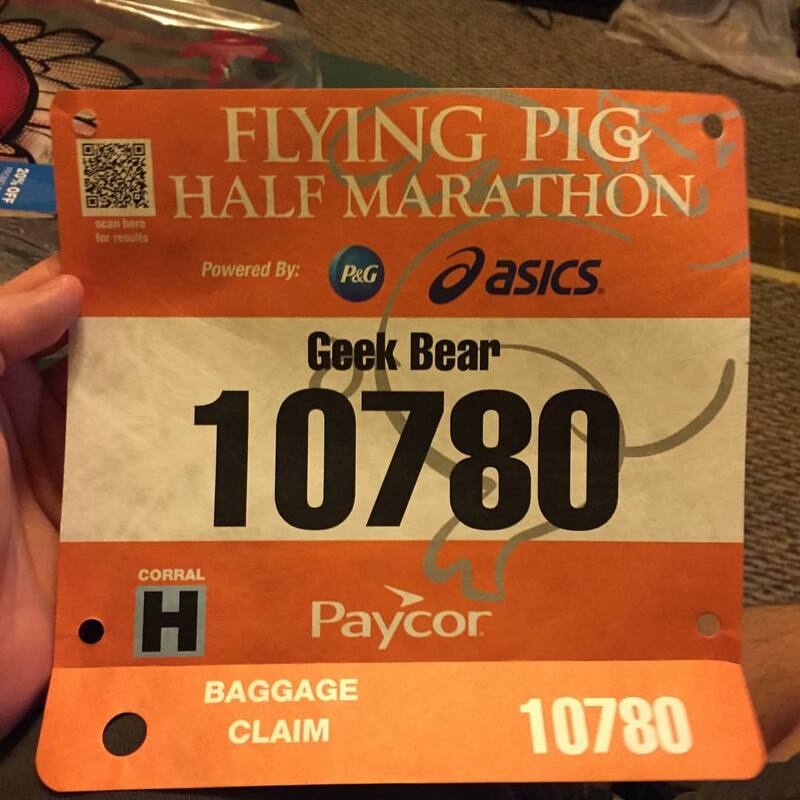 So, I went out after that post and signed up for the Flying Pig Half Marathon in nearby Cincinnati. 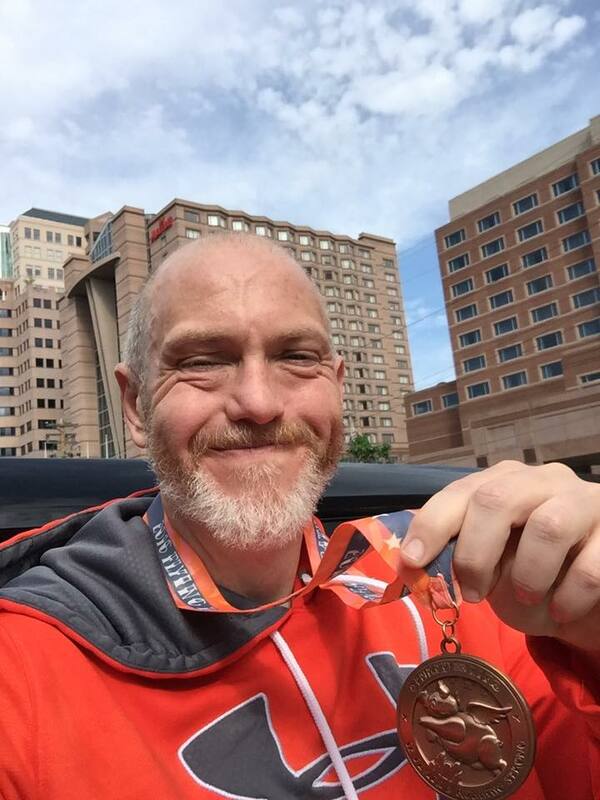 I admit that I was terrified to do it as 13.1 miles is a distance that I had never ran before. The longest race that I had run was a 10K. I had been able to do it with a time of one hour and eight minutes. It was fun to do but not an easy accomplishment. I was committed though and put my money where my mouth was. Don’t get me wrong, I trained. I was able to do an eleven and a half mile run in two hours and twenty minutes. I just was not prepared for the course that I was about to run, the emotions that are presented on the course, and the amount of people at the race. My training course took me around my neighborhood. It is hilly but these hills would be considered small and rolling. They were difficult but not bad. The course for the Flying Pig Half Marathon meanders up one of the seven hills that comprise the city of Cincinnati. I was surprised to discover that this hill stretched for over two and a half miles. Sweet spaghetti monster was that hard! I was in no form to run that distance uphill. It was like getting repeatedly kicked in the legs and I ended up walking up the most of that hill. Of note, this is not the only hill of the race, just the biggest and longest. The race crossed several bridges and one does not think about bridges as hills when in a car. Run a few bridges and you will know the fuckers definitely qualify as hills. I did it though and was able to complete the race with a time of two hours and thirty-eight minutes for a pace of 12:09 per mile. My goal was three hours and I beat it! The number of people at a half marathon/marathon is staggering. The largest race I had attended was the Thanksgiving Day 10K which had about fifteen thousand people attend. I think the estimates put the attendees at over thirty thousand for the race. This means that you start the race from a corral and your start time is staggered. Being my first race, I was in the last corral and got to watch the waves of people leaving the starting line. It was impressive. The sheer press of humanity was daunting for me as I am a shy person. the corrals force people to be elbow to elbow and I was constantly apologizing for bumping into someone. The variety of people was amazing as well. The other races I have attend had made me feel that races were a very homogeneous activity and the Flying Pig made me see that this doesn’t have to be the case. I was also impressed with how nice the people were as well. I was lost trying to find my corral and people answered my questions and helped me find my way. I think I saw only one sour note while waiting for the race. A nice gay couple were talking in front of me as the national anthem started playing and a lady rudely asked them to be quiet and for them to remove their hats. She patently ignored the other couples right next to them who were talking as well and both had hats on. It happened so quickly and both the lady and the couple moved off in the crowd before I could say something. Me and my piggy medal! leaving me misty-eyed as I write this. You run out of energy to keep the emotions in check and those signs just punch you right in the feels over and over. For me, it was rougher as I didn’t think I had anyone one waiting to see me cross the finish line. So, those signs were reminders to me of this as well as pointing out that people did care. So, there were points on the course were I am sure I was crying. Turns out that as I crossed the finish line I was able to check my phone as I had received some texts while running but had not effort to spare to check. My best friend Stacy had been able to come down and watch me finish the race and got some video of it. Ugly crying…flat out ugly crying. Over all the flying Pig Half Marathon was tremendous experience. The race organizers and volunteers did a great job and I felt very welcome at the event. The other racers were nice and fun to be around. The crowds that lined the route were heart warming and tear jerking at the same time. If you are a runner and are able to do a half marathon, I say do it. It is a peak experience that you will not regret. This geek bear does not regret running it! The movie madness of last week all began on Wednesday when a friend and I went to see Magic Mike XXL. I was not surprised to be one of the few men in the theater. Luckily I was there for the same reason as most of the women, which was to see handsome men dancing around mostly naked. I walked out of the movie having had a good time and thinking that it was a good movie. It was during my run the next morning that I began thinking about the movie I had seen that the prior evening. For once, it isn’t what you think. First, let me tell you a little about the movie itself. Magic Mike XXL takes place a few years after the end of the first movie. The movie opens with us following Mike as he is working at his own business. The audience is treated to watching him and his employee work hard at delivering and creating furniture. at the end of a rough day, Mike receives a call from Tarzan implying that Dallas has passed away. When Mike shows up at the “Wake”, it turns out that Dallas just left and the guys from the show just wanted to talk to Mike. Dallas has abandoned the group just as they were heading to the male stripper convention and want Mike to come back and help them out. What follows is a road trip of discovery and dancing. It was while running that certain things about the movie became clear. One of the first realizations was that the story was a lot more solid than the first movie. Yes, I know it sounds a bit silly but it is true. The first movie was a bit of a mess and depended on the audience being distracted by hot men dancing around. This time there are still hot men dancing but there is a story to surround them that is interesting to watch and allows the characters to shine. I will freely admit that the road trip of self-discovery is pretty standard story but it works really well for these characters. In addition, the laughs that come from the situations felt honest and unforced which was unexpected. The biggest thing that hit me as I was running was that the movie was a bit subversive. On the face it is a movie about aging male strippers. But hidden through the movie are subtle statements about diversity, gender, and identity. One of the scenes in the movie has the group of guys struggling with the depression of having to head to this event ill-prepared. To improve their self-esteem, the group heads to an open stage evening at a gay bar. The idea is that the stage is open for anyone that wants to vogue to get up and strut their stuff. The men are their to show off and take in the adoration of the crowd. They don’t treat the patrons, or the drag queen M.C. any differently. To the contrary, they value the adoration of the crowd and need their approbation. At the after-party, there are the requisite hot girls hanging about but the Drag Queen is part of the circle around the fire. This same scene introduces one of the major female characters of the movie. Zoe is woman that is hanging out with the drag queens from the bar taking pictures. She begins taking pictures of Mike that night and they begin a flirtation. During their conversation, she shares with Mike her drag name and mike shares his drag name with her. Zoe ends the conversation by stating that she is currently in a girl phase when it comes to relationships. When Zoe shows up again, she appears to be depressed. Mike takes the time to find out what is wrong and attempts to fix the problem if he can. This is the point where one would expect the dude to pressure her, but it never happens. Another small thing that is easily overlooked is the women that the men dance for. In the first movie, the women that were graced by the male dancers were stereotypical Hollywood beauties. In this movie, the women who are danced for are more representative of all women. In addition, the women are all treated with a level of adoration that is never belittled later in the movie. This is highlighted by a scene where the group is trying to convince Richie that he can create his own routine. They pull off of the road at a convenience store. They point out the woman working the counter and tell him that he has to get her to smile. The woman in question is your normal, every-day distracted convenience store clerk. She has her face buried in her phone. Richie begins to slink around the store and works very hard to get her attention and earn her smile. When she does smile, the group celebrates his success at making her happy. At no point is the woman ever treated as something less than deserving of his attention. Finally, the movie takes a jab at gender stereotyping. There is a scene in the movie involving Andie MacDowell. The men have arrived at her home as her daughter has told them that they could stay but did not inform mother or her friends. When these older women meet the men, there is this awkwardness and discomfort that fills the screen. The groups dance about the subject of what the men do until the young women come in and broach the topic. With the cat out of the bag, the tension eases somewhat. The awkwardness hangs around until MacDowell’s character confesses that she has only ever had one man and that her daughter shouldn’t have to live that way. It comes out as a lament for how women are told to be virginal and keep themselves for one man. With the male strippers in the room, the hypocrisy of this expectation is apparent. It is after this revelation that Tarzan, the quiet one, finally speaks. He opines that he wishes that he could find what she had, the one person to be with hold and cherish when the opposite is what is expected of him. Magic Mike XXL is a movie filled with handsome men, wonderful dancing, subtle social commentary, and an embracing of diversity that is unexpected in this type of movie. Definitely a three bear paws out of four movie. I thought I would start a new category here at Geek Bear’s Den. I’ve entitled it thoughts from a run. I enjoy running and it gives me time to think and sometime the oddest things jump into my head. So, I thought I would share them with the internet. Isn’t that what the cubs do nowadays? I normally run early in the morning. I get up around 4:30 am on the weekdays and head to the gym and run after a workout. Today, I hit the pavement around 5:45 am. It was a nice cool morning, in the mid-60’s with moderate humidity. A nice day for a run. As I was heading into my second mile, I ran into a thick fog. It flowed out of the small valleys that are scattered around the region where my gym is situated. With the predawn light and the eerie quiet of an empty road, It felt like the mists of Ravenloft had come to take me. 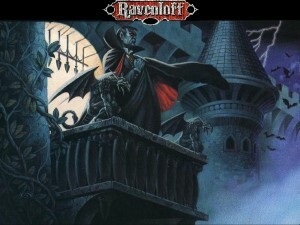 For those who may not be familiar with Dungeons and Dragons, Ravenloft is a setting for the game. It is subtitled the Domain of Dread and was a world filled with both fantasy tropes and Gothic horror. It was a demi-plane that served as prison for beings of immense evil. These beings would commit some heinous crime, normally in the name of their twisted version of love, honor, or some other virtue. Gothic, remember. The mists would come from nowhere at the height of the drama and sweep them away to Ravenloft. In Ravenloft, they would be given a domain wherein they were normally almost all powerful. The catch? They could never leave the boundaries of their domain and they would be forever tortured by the one thing for which they truly ached. If they killed their true love in a rage, they would be constantly reborn, only to continually slip through their fingers. Yes, I know I slipped into Basil Exposition mode there. It’s important. This struck me this way during my run due to the the Supreme court’s recent finding that I have the right to marry. You see, waiting for the decision in regards to this was rather fraught. States, like Indiana, were working hard to make it legal okay to discriminate against us members of the LGBT community. Kansas had made it legal for the state to discriminate in the hiring and firing of state employees if they were members of the LGBT community. There was a bill floated in California to make it legal to shoot members of the LGBT community. I could go on. This much negativity is rough and combine it with the constant statement by conservative religious people that we are immoral and will destroy the fabric of society certainly makes the case for evil. Couple this with the vociferous outcry of those self-same religious conservatives after the ruling and my own home county declining to issue any marriage licenses due to religious convictions, the idea that the mists of Ravenloft had come for me kinda makes sense. As I ran and contemplated the idea, I began to chuckle an smile. 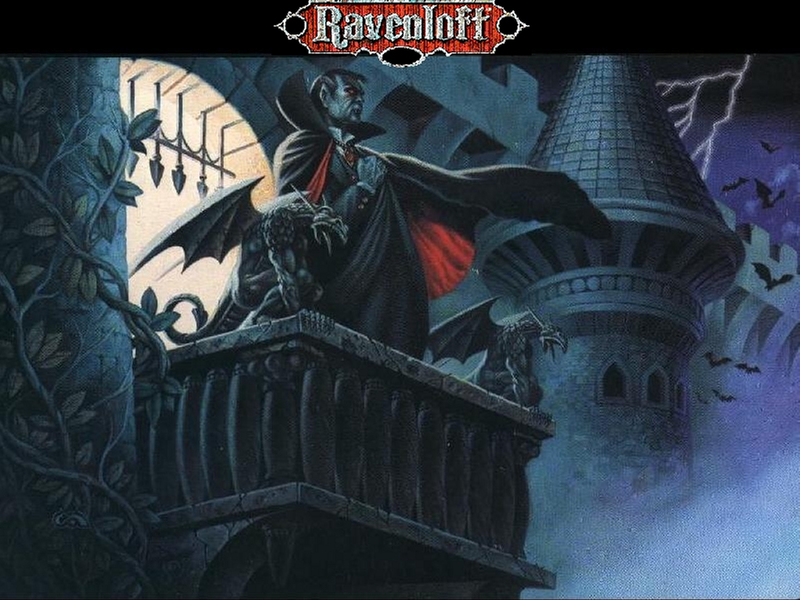 Ravenloft is a land of dark colors, drab individuals, cloudy skys pregnant with rain. If I was to have my own domain, I would certainly wreck the Gothic aesthetic. Instead of bleak country filled with angst, I pictured mine as bright and colorful. I would be the proud Pappa Bear taking care of my subjects to ensure that they were able to live the lives they truly wanted. There would be singing, dancing, education, and equality that could not be found in any other domain. The curse that comes with a domain would be devastating and two fold. The first would be that my domain would be a bright shining beacon in a world full of darkness, horror and hatred. The people of my domain would certainly want to travel and I would not be able to stop them despite knowing that they would literally being going to a horrific doom. the second does fit well with the Gothic milieu though. I would be the big bear that is surrounded by love and light and forever be alone. Every time someone would grow close to me, the mists would either come and take them or a jealous Dark Lord from another domain would ensure that my curse is fulfilled. It was just an odd thought about the ven diagram that my life can be at times. It made the run easier and entertained me with thoughts about how I would be able to close my borders with rainbows and welcome adventurers fleeing from the wrath of another Lord. I’ll keep my fingers crossed that we keep making the progress on equality both for LGBT and all the minorities here in America.